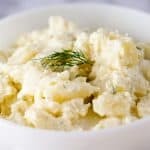 I don't think this easy potato salad could actually be any easier to make. But don't let that fool you. It packs a massive flavor punch. For pressure cooker: Add potatoes and 6 cups of water to Instant Pot. Close lid and set manual time for 4 minutes. Once cook time complete, quick-release pressure. Pour potatoes into a colander, then transfer to a sheet pan to cool. For stovetop: Add potatoes to a large pot and cover with water. Bring to a boil, then reduce heat to medium-low and simmer for about 10 unites - until barely tender. Transfer to a sheet pan to cool. In a large mixing bowl - add mayo, Dijon, lemon juice, dill, salt, and pepper and whisk to combine well. Then add potatoes to bowl and gently mix until fully combined.